Smoking bans are slowly popping up in local communities and beaches all over the United States, but federal legislation has already banned smoking in businesses, including bars, restaurants and workplaces. Belgium has also passed smoking bans along the same lines as those passed in the United States. The smoking bans were put in place to protect non-smokers from the health effects of second-hand smoke, but the effects have also reached pregnant women. According to a new study published in BMJ, smoking bans in Belgium have reduced preterm birth rates as well. Investigators collected data from more than 600,000 live births. Infants were born between 24 and 44 weeks gestation. When the smoking ban was taken into consideration, researchers noticed a significant drop in preterm births. After the initial ban in 2007, preterm birth rates dropped by more than 3%. That number increased to a drop of nearly 6% when the final phases of the smoking ban were implemented. Contact with tobacco smoke during pregnancy has been associated with preterm birth and various health complications in newborns and offspring of parents who smoke. Recent studies have even associated paternal smoking habits with offspring obesity risk. 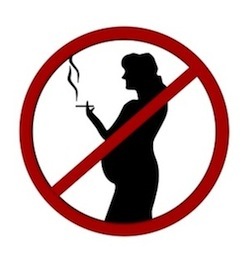 Smoking bans may play a crucial factor in improving preterm delivery rates and reducing childhood obesity by diminishing contact with second-hand smoke during pregnancy. This is not the first study to report reduced preterm delivery rates after smoking bans. In March 2012, a study published in PLoS Medicine reported similar results in Scotland. Researchers there reported a 10% reduction in preterm delivery rates, but they also noticed fewer mothers choosing to smoke. After the ban, the percentage of mothers choosing to smoke during pregnancy reduced from 25.4% to 18.8%, a nearly 7% decline. Source: Bianca Cox, Evelyne Martens, Benoit Nemery, Jaco Vangronsveld, Tim S Nawro. "Impact of a stepwise introduction of smoke-free legislation on the rate of preterm births: analysis of routinely collected birth data." BMJ 2013;346:f441.